Gear assemblies are ubiquitous in rotating machinery. They appear in couplings and drives, often as gear trains, where they transmit torque at a ratio or at an angle between moving bodies. Some, like rack-and-pinion assemblies, serve special purposes, such as converting between rotational and translational motions. The kinematics of gears in mesh arise from what are, in computational terms, algebraic constraints between the gear rotations. Gear teeth cannot physically overlap and the gears must, at a contact point known as the pitch point, move with the same instantaneous linear velocity. Bevel Gear Constraint — Couple two gears, generally conical in cross-section, with intersecting rotation axes meeting at a right or general angle. Bevel gear assemblies are common in the drivetrains of rotorcraft, where they transmit torque between rotor shafts mounted at an angle. 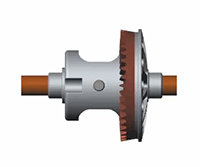 Common Gear Constraint — Couple two gears, generally cylindrical in cross-section, with internal or external meshing and parallel rotation axes. Common gear assemblies appear in automotive transmissions, often as planetary gear trains, that transmit power from engine to wheels at preset torque ratios. Rack and Pinion Constraint — Couple a rotating pinion to a translating rack with the respective motion axes facing at a right angle. Rack-and-pinion assemblies are common in power steering systems, where they transform a rotation of the steering wheel into a translation of the tie rods, causing the steering arms and wheels to turn. Worm and Gear Constraint — Couple a worm and a gear with nonintersecting rotation axes facing at a right angle. Worm-and-gear assemblies form the foundation of slew drives built into solar trackers that are designed to follow the sun and maximize the intensity of sunlight striking a solar panel array. 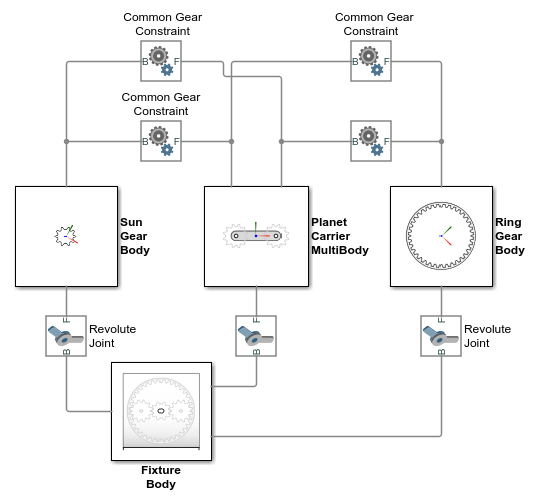 From a topological point of view, gear assemblies form closed kinematic chains, or loops. A simple loop comprises two or more gears—the term used loosely here to include worms, pinions, and racks—and a fixture, to hold the gears. The gears connect on one end to the fixture through joints, and on the other end to each other through a gear constraint. The joints define the degrees of freedom available to the gears before they are brought into mesh. The degrees of freedom encode the types of motion the gears are capable of and the respective motion axes. The gear constraint couples the gears so that they move as though in mesh at a speed ratio determined from the gear (pitch) radii or tooth counts. More complex model topologies are possible. In a planetary gear train, a ring gear adds a second kinematic loop to the model. Planet gears attached to a carrier add still more kinematic loops. Still, no matter how unique the gear assembly, the model must by its nature comprise at least one kinematic loop. The distance between the z-axes be equal to the distance between the gear centers. The follower frame origin lie on the xy plane of the base frame. The z-axes of the base and follower frames point in the same direction. The gear constraint blocks enforce the assembly restrictions, but during model assembly only, when the gears are first placed in mesh. Once simulation starts, it is the task of the model to ensure that the gear placement still satisfies the assembly requirements. The gear constraint blocks then enforce the meshing constraint but merely monitor the assembly constraints, to ensure that the gears remain in a valid configuration. Gear constraints are parameterized in terms of pitch circle dimensions. A pitch circle is an imaginary circle concentric with a gear or worm and tangent to the tooth contact point. Every gear and worm has a pitch circle. 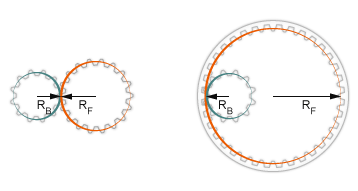 The figure shows the pitch circles of spur gears with external and internal meshing. The parameters RB and RF denote the gear pitch radii. You can approximate gears, worms, and racks using standard solid shapes. Use cylinders with radii equal to the pitch radii for gears and worms. You can use cones for bevel gears and bricks for rack shapes. The figure shows an example with spur gear geometries reduced to cylinders. If you are new to modeling bodies using standard solid shapes, see Model a Simple Link. For more detailed geometries, use the General Extrusion solid shape. This shape enables you to specify the toothed cross-sectional shapes of gears and racks. The Solid block generates 3-D extrusions by sweeping the cross-sections along their normal axes. The figure shows an example with spur gear geometries modeled as general extrusions. For an example showing how to model a simple body with a General Extrusion solid shape, see Modeling Extrusions and Revolutions. For precise geometries, you can load 3-D shapes into Solid blocks using STEP or STL files. You must obtain the STEP or STL files from external sources. 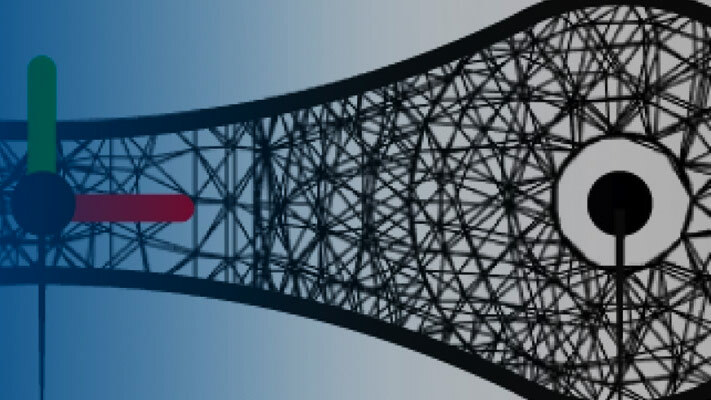 If you have CAD models of gears, worms, and racks, you may be able to export them in STEP or STL format for use in Simscape™ Multibody™ software. The figure shows an example with spur gear geometries imported from CAD models via STEP files. The physical models provided by the gear constraint blocks are idealized. Gear friction, inertia, and backlash are ignored. You add viscous damping to the gear shafts by specifying damping coefficients in the joint blocks that represent the shaft joints. The shaft joint blocks are typically located between the gear shaft bodies and the gear carrier body. You add inertia to the gears by modeling the gear bodies using Solid, Inertia, or General Variable Mass blocks.